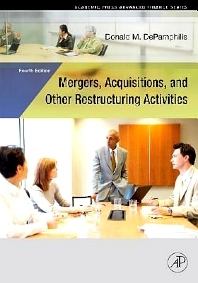 Mergers, Acquisitions, and Other Restructuring Activities, Fourth Edition, is a real-world teaching tool for finance courses on mergers, acquisitions, and other restructuring activities. The author, Dr. Donald DePamphilis, shares his academic knowledge and personal experiences with over 30 such deals. The book covers 99 case studies that span every industry, country, and region worldwide demonstrate how deals are done rather than just the theory behind them, including cross-border transactions. The book is ideal for MBA and advanced undergraduate and graduate finance students taking courses in mergers & acquisitions, corporate restructuring, and corporate strategy.